"It’s not written in scripture that everyone has to see the same thing at the same time." "Why am I here and not over there?" "This is just like the opening of the final act of Hamlet," a woman said to a young boy as they sat together on bleachers awaiting the start of Robert Whitman's Passport (2010) on Sunday, April 17, in Beacon, New York. We were just a few yards from the Hudson River, not far from Dia:Beacon, and two poncho-clad men with shovels — gravediggers of a sort — moved about a dirt mound as a yellow backhoe stretched its limb and growled. Lightning had forced the cancellation of the previous night's performance, and it felt like thunderstorms could break out again at any moment, shuttering this second, final show. "What's Hamlet?" the boy asked. "It's a play by the English writer Shakespeare," his mother said. She didn't mention that it ends badly. I arrived by bus from the city just before 8 pm and entered Beacon's Riverfront Park to find Dia director Philippe Vergne handing out ponchos and directing people toward the haunting scene along the water. Another contingent of Passport viewers was filing into the Alexander Kasser Theater, in Montclair, New Jersey, some 60 miles away, at the same time. Whitman planned to stage two different performances simultaneously, beaming video of the actions in between them. As the clouds grew darker and the temperature dropped, the New Jersey theatergoers seemed like the far smarter group, but we were in this together: if a storm started, both parts of the performance would be canceled. 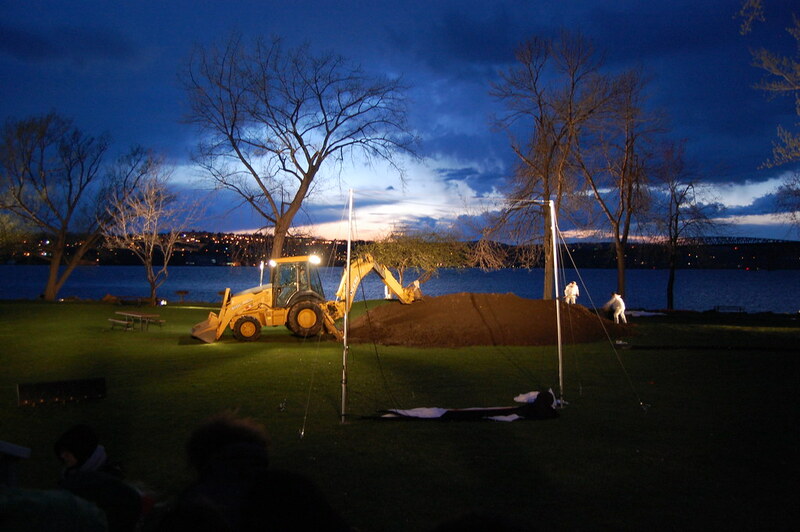 Another pre-performance view, with the diggers hard at work and the horse trailer at the ready. "I like things that stay pretty abstract, even though you could put meaning," Whitman tells Joan Waltemath in this month's Brooklyn Rail, and Passport proved to be nothing if not abstract, a series of slow–moving, seemingly unrelated episodes floating through the space in front of us. A video projected on the side of a horse trailer showed fire spewing from a faucet, an image that Jonathan T. D. Neil explores in his take on Passport in ArtReview. Whitman's poncho-clad crew used rope to hang three gigantic white shirts from trees, which served as screens for video projections of rotating, flaming orbs. People ran up the dirt mound from behind, jumped over the top and rolled slowly down the other side, the soil sticking slightly to their plastic clothing. A man to the left of the audience shouted a lengthy definition of the word "word." A man piloted a rowboat along the river from right to left (north to south). Its edges were limned with a roaring fire and another person — a woman, it seemed — sat still inside. "[A] boat on fire is probably one of the worst things in the world," Whitman tells Waltemath. Still burning, it returned later, heading in the opposite direction, a mirror image, a repetition undermining any traditional sense of narrative progression. Repeated, it seemed caught in a moment of perpetual destruction, a representation of terror. This doubling recurred throughout the piece. A white horse appeared twice carrying a young woman, once with her upright, the other time with her on her back, her eyes closed. Two screens made from white fabric served as a backdrop for video footage, close-ups of eyes and mouths that recalled Marilyn Minter. The formal aspects of Whitman's work were filled with doubles as well: the two scheduled performances (Saturday and Sunday) and the two locations, Montclair and Beacon. 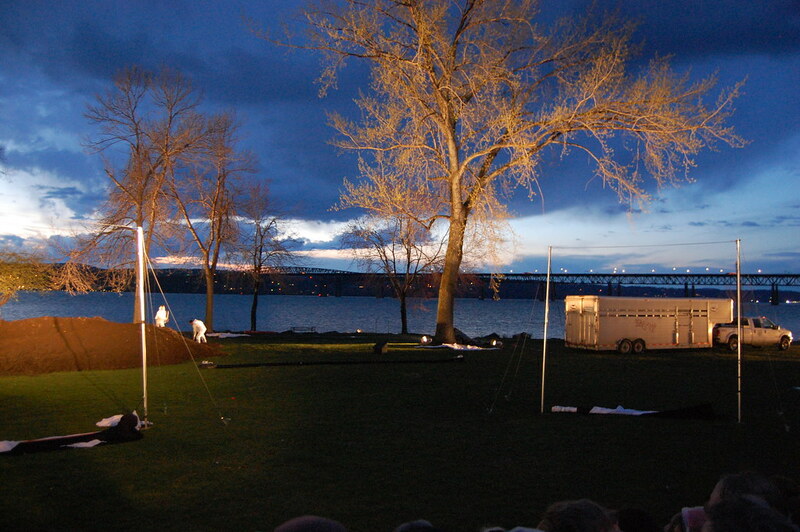 Segments of the Montclair performance were beamed into the Beacon show onto the side of a horse trailer. We watched as white–clothed performers brought a brown mound on stage in the video. In front of us, our performers did the same. Both of the strange brown constructions spewed paint in a rainbow of colors, gushing down the sides like lava flowing from a volcano. The video footage was grainy and occasionally halting, the interruptions making the images seem more live, more real, underscoring our partial view and perhaps even carrying political connotations. "It has that look of cell phone reports that we are getting from these war zones," Whitman says to Waltemath, perfectly accurately, of the film stream. The footage from Montclair was sparse and often closely cropped. We could not see the audience there or hear the sounds they were hearing, and one wondered what they were seeing of us, and our performance, on the video that they were receiving from our end. Could they see or hear the Metro-North trains shooting by behind us? Did they know that rain was beginning to fall up north? This devoutly non-programmatic pitch of Passport — with the mysteries that surround its content and form — sharply departs from the straightforward, rule–based structures of today's most popular performance works. Like our times, Whitman's work was instead provisional and fractured, literally — and generously — dispersed.